Steering wheel covers make driving more comfortable. They help avoid the hands getting sweaty and slipping off of the wheels. They also serve to provide a nice looking accessory to the car, giving it a more upscale look. Steering wheel covers are definitely a sought-after accessory for their comfort and style, and I have taken the liberty of reviewing a few to find out which one is best. 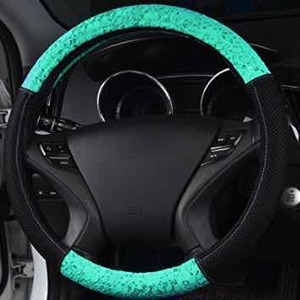 When searching for a new steering wheel cover, I first look for something that is going to be able to withstand lots of use, as this is something I will be using for hours a day, multiple times a day. The SEG Direct Black and Gray is durable and strong, made from smooth microfiber leather that feels as good as it looks. It has soft padding that is comfortable and breathable and contours to the shape of my hand. This gives me more control by delivering a more solid grip on the wheel. This is one of the best steering wheel covers for comfort. The next thing I like to check on is its resistance in general. Will it take away the heat on a warm summer day? Does it help to keep my hands from freezing in the winter? Will it stay in place all of the time when I turn the wheel? With the SEG Direct, the answer to these questions is yes. It also resists any wear that other steering wheel covers might experience. The SEG Direct is both eco-friendly and deemed healthy for daily use without harming or irritating the skin. It fits middle-sized steering wheels that measure 14.5 inches to 15 inches. Application. Some reviewers stated that this steering wheel cover was difficult to slip on, but I saw no issue. Perhaps they did not mind the sizing of the cover and attempted to put it onto something too large. Still, it is worth mentioning for the sake of an honest review. I’ll start out by saying that the Vitodeco fits most medium sized steering wheels measuring anywhere between 14.25 and 14.75 inches in diameter. The Vitodeco is super simple to slip onto the steering wheel. It took me no time at all and instantly made my wheel look more elegant and luxurious. I love that the Vitodeco doesn’t bake in the sun, nor does it freeze up like the rest of my interior when it is cold outside. A considerate aspect of the Vitodeco is the fact that it has this Dragon Scale Design that gives me a really solid grip on the steering wheel as I drive. No more slipping around or worrying about my cover coming loose. This certainly makes it easier to hold onto, and one of the best steering wheel covers in terms of grip. The Vitodeco Steering Wheel Cover is made from an ultra-sleek piece of odorless, nontoxic, authentic leather. It protects itself against scratches, general wear and being burned by the sun. Price. This cover seems to run at a higher price than most, but for a genuine leather cover that doesn’t get hot or cold, it’s a total steal! The A-Lighting is a rather universal steering wheel cover and can fit onto steering wheels that measure 14.5 inches in diameter. The A-Lighting Wheel Cover is multicolored and vibrant in a cute pattern, bringing a sense of fun to my car. The aforementioned design of the A-Lighting is made of coarse flax cloth that is sweat-absorbent to promise a comfortable, slip-free grip. It is also handmade to ensure quality. The A-Lighting was super simple to slip on. It took less time than some of the others that I have tried. If you’re looking for the best steering wheel covers to slip on with ease, this is it. Odor. I noticed upon taking it out of the package that it had a bit of an unpleasant smell, but after about an hour or two of letting it air out, it was completely gone, so I hardly consider this a downside. I figured this should be mentioned so that anyone reading this is prepared. The Delray Lace and Spacer Wheel Cover is an eco-friendly product that is designed to never irritate the skin, and it definitely hasn’t hurt mine. There is a breathable mesh that helps prevent slippage from sweat, and its odorless nature makes it one of the good steering wheel cover on the market. The Delray Lace and Spacer has a unique, beautiful lace design with striking stitching. It is definitely one of the most unique steering wheel covers that I’ve ever used for that reason. This steering wheel cover is made with a super thick padding that has grooves in it for a simple grip. The Delray Lace and Spacer is also simple to install to any steering wheel that measures 14.5 to 15.5 inches in diameter. The Delray Lace and Spacer Wheel Cover is able to resist both extreme heat and extreme cold, making it so that I am never uncomfortable burned on a hot day or feeling the pain of the cold during the winter. It also does a great job of preventing general wear and tear. Size. Again, some have said that the Delray Lace and Spacer didn’t fit their steering wheels, but it is likely that they did not pay attention to the sizing specifications before attempting to install it. The Mayco Bell Car Steering Wheel Cover is the perfect fit for most any sort of car with a medium sized steering wheel. This steering wheel cover is great for steering wheels that measure 14.8 to 15 inches in diameter. One of the most annoying things about some of the steering wheel covers that I have tried out on my car is the fact that getting them onto my steering wheel is a breeze. It slips right on with no stretching or serious effort. The Mayco Bell Car Steering Wheel Cover is made from ultra sleek, smooth and seriously strong and durable microfiber PU leather. It looks as wonderful as it feels and does not slip from beneath my hands and pose a safety risk at all. Of course, one of the biggest benefits of having a good steering wheel cover is that it is going to work to protect my hands from the elements. The Mayco Bell Car Steering Wheel Cover is at once resistant to the heat of the sun and the bite of the cold. It also resists general wear and tear from frequent use and is highly breathable for my comfort. Price. The price may deter some buyers, but I believe that it is one of the best steering wheel covers for the price. I think you definitely get what you pay for with the Mayco Bell Car Steering Wheel Cover. I have chosen the SEG Direct Steering Wheel Cover as the winner. It looks amazing in my car, is super ergonomic and doesn’t irritate my skin. It does a wonderful job of resisting both heat and cold so that I am always comfortable when I drive. It’s made from a nice microfiber and doesn’t slip. I recommend this for drivers who want a high-quality cover without spending too much money.